I’ve been out of public accounting for a number of years, but one thing I remember vividly was the busy season 10: the additional 10 pounds I gained because of all the pizza, the fast food, and the lack of exercise. 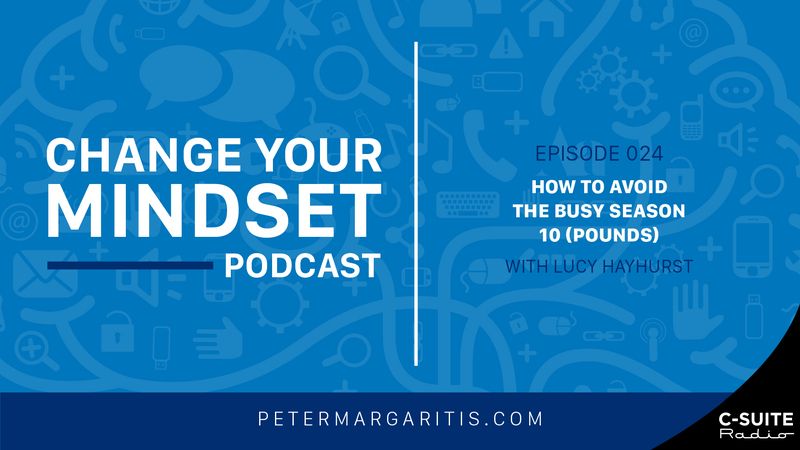 So today, I asked licensed and registered dietitian and nutritionist Lucy Hayhurst to be our guest and provide us with some strategic tips on how to avoid the busy season 10. Lucy is co-founder of Well Balanced Nutrition, where their goal is to help people worry less, love what they eat, and live their best life. Now, you don’t have to be a CPA or an accountant to learn from this episode because all professionals, at some time during their work year, will have to put in the extra hours over an extended period of time. When this happens, most of us revert to fast food and no exercise to get through this high-stress timeframe. Often, when we talk about nutrition and wellness, people fall into the trap of thinking that they’re doing everything wrong, or that there’s too much they need to change to even bother – but thinking like that is the fastest way to fail. So, instead, Lucy encourages people to raise their awareness, then decide on just ONE thing that they can do better. You know that old adage, “Everything’s good in moderation?” Lucy tells us it’s total crap. You have to know thyself and recognize what your trigger foods are. She mentions the book Better Than Before by Gretchen Rubin, which talks about the differences between moderation and abstinence. Some people can have just a few cookies or chips and be fine, but some people can’t have the package in the house without devouring it all – so it just takes a little awareness about what will hurt and help your wellness journey. After you remove any obstacles to your health, pick just ONE thing to work on during this busy season; one bad habit you can make a good habit, which will in turn change your mindset around your health. Baby steps – that is the answer. Then maybe you can add on another healthy habit when you’re less stressed this Summer, or during the next busy season. Lucy Hayhurst: [00:00:00] Often, when we talk about nutrition and wellness, people are like, “I’m doing everything wrong. I have to change it all.” And that’s the fastest way to fail. So, instead, we talk to people. Once you raise your awareness, then step two is deciding on just one thing that you can do better. Peter Margaritis: [00:00:25] Welcome to Change Your Mindset Podcast, formerly known as Improv is No Joke, where it’s all about believing that strong communication skills are the best way in delivering your technical accounting knowledge and growing your business. An effective way of building strong communication skills is by embracing the principles of applied improvisation. Peter Margaritis: [00:00:46] Your host is Peter Margaritis, CPA, a.k.a. The Accidental Accountant. And he will interview financial professionals and business leaders to find their secret in building stronger relationships with their clients, customers, associates, and peers; all the while growing their businesses. So, let’s start the show. Peter Margaritis: [00:01:13] Welcome to Episode 24, everyone. And today, my guest is Lucy Hayhurst, who’s a license and registered dietitian and nutritionist based in South Durham, North Carolina. Lucy and our business partner, Kristen Norton, founded Well Balanced Nutrition. And the website is www.wellbalancednutrition.com. Peter Margaritis: [00:01:34] Although I’ve been out of public accounting for a number of years, the one thing I do remember vividly was the busy season 10: the additional 10 pounds I gained because of all the pizza, the fast food, and the lack of exercise. I asked Lucy to be the guest and to provide you with some strategic tips on how to avoid the busy season 10. Peter Margaritis: [00:01:59] Now, you don’t have to be a CPA or an accountant to listen to this episode because all professionals, at some time during their work year, will have to put in the extra hours over an extended period of time. When this happens, most of us revert to fast food and no exercise to get through this high-stress timeframe. Well, by the end of this episode, Lucy will give you some practical tips to help avoid the additional weight, as well as being more strategic in your food choices during stressful periods of time. 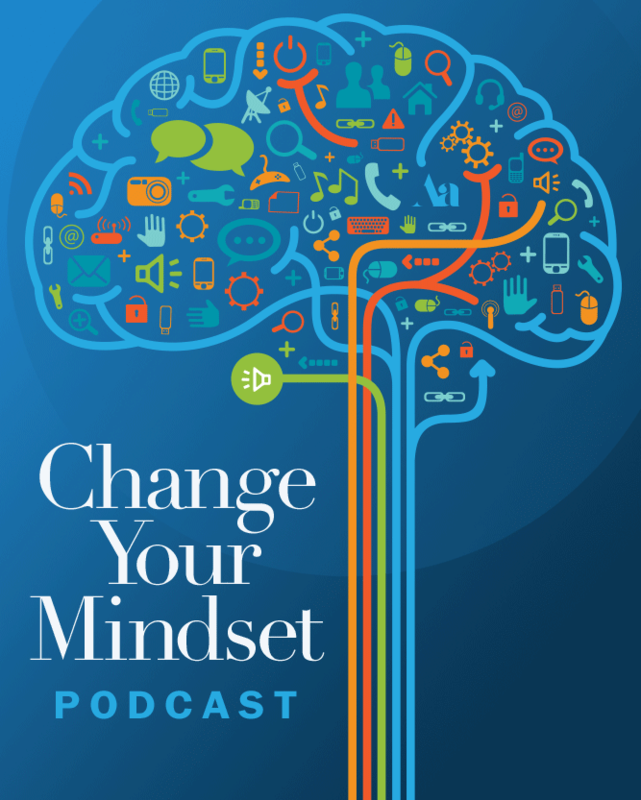 Peter Margaritis: [00:02:35] Now, before we get their view, I want to share with you that Change Your Mindset is now being distributed on C Suite Radio. You can find Change Your Mindset and many other outstanding business podcasts on C Suite Radio by going to www.c-suiteradio.com. Announcer: [00:02:54] This podcast is part of the C Suite Radio Network, turning the volume off on business. Peter Margaritis: [00:02:59] And, now, for a quick shameless plug. Other than being the host of this podcast, I’m an author, a public speaking coach, and a professional speaker. I’ve worked for sales teams, C suite teams, engineers, and accounting, and finance teams. If you’ve been listening to this podcast for a while and think that I could add value as a speaker to an upcoming conference, please contact me at Peter@PeterMargaritis.com and put it in the subject line CYM Speaking Opportunity. I would greatly appreciate it. So, now, let’s get to the interview with Lucy Hayhurst. Peter Margaritis: [00:03:41] Hey, welcome back, everybody. We’ll do something that we haven’t done in a while, and we’re talking to Lucy Hayhurst, and she’s going to talk to us about how we can become healthier eaters and to get that motivation going to get help with the stress and just be healthier in our business lives. Lucy, thank you for taking time out, I can only imagine your hectic schedule, to spend some time with me on my podcast today. Lucy Hayhurst: [00:04:11] It’s my pleasure, Peter. Thank you. And before you all tune out, we promise, this is going to be more fun than just talking about all those silly fruits and vegetables. Peter Margaritis: [00:04:19] That’s right because she’s already shared some stories with me. I’m going to let her tell you those. But if you could, Lucy, could you give the audience just a little bit of a background and maybe a funny story or two that– how did you got into this business? Lucy Hayhurst: [00:04:33] Oh my gosh, Peter. So, I was really, really surprised when I got to the University of Dayton. That’s where I did my undergraduate studies. And I had always enjoyed food. My mom said I was unique because I would take Subway as my fast food choice instead of burgers and fries. I also walked out the door every morning with a pop tart on my way to high school. So, don’t let that fool you. Peter Margaritis: [00:05:00] Balance. You’re balancing it. Lucy Hayhurst: [00:05:02] Balance, that’s right. A balanced nutrition. So, when I got to University of Dayton and found out that there was a whole career path that lets you talk about food and exercise everyday, I’m not kidding, I thought everybody was going to be knocking on the door begging for this job. I’ve since learned I’m a little unique. Not everybody is excited about that, which might be a surprise for you all out there. And maybe not everyone’s as excited about your spreadsheets with all those numbers. I am excited. I’m excited for you guys. But, really, that was just it. I just knew from the moment I found out that this was a thing, being a dietitian was definitely for me. Lucy Hayhurst: [00:05:47] What’s really great fun story, I went into the director’s office. Her name’s Patricia Dolan. And she sat me down and asked me some hard questions. And I said, “I really don’t know. Do I want to be a dietitian, or do I want to be a nutritionist?” And she gave me the look. You know, the look. And that until you know the difference, you have no business being in my office. I didn’t know that being a dietitian was a four-year undergraduate with about a year, a thousand-plus hour internship, and a very serious registration exam versus a nutritionist, which is not as heavily regulated in some states. And you can just go online and do a six-week course. And, now, I’m Lucy, the nutritionist or Peter, the nutritionist. Peter Margaritis: [00:06:39] So, she gave you that look and made you go research the difference between the two of them? Lucy Hayhurst: [00:06:44] Yes, exactly. So, now, I know. Peter Margaritis: [00:06:47] So, now, you are. And you’ve got this — We all have a love for food. What’s your tagline? I remember you shared something about it. Lucy Hayhurst: [00:06:55] Well, my original personal tagline is “I’m on Earth spreading the good news of fruits and vegetables.”. Lucy Hayhurst: [00:07:03] But for Well-Balanced Nutrition, what we really do is help you worry less, love what you eat, and live your best life. Lucy Hayhurst: [00:07:14] Dot com. Peter Margaritis: [00:07:15] … dot com, all one word. We just got to make sure we get to plug in. And, actually, go to the website. It is pretty cool. They’ve got one of the dropdown boxes for meal plans, and they’ve got a pretty cool planner that’s online, digital that you can — I was watching the video that you can put your meal in, and how many servings, and it keeps track of all the nutritional data for that meal, as well as for the day, for the week, which is really cool. I’m going to have to try that out when we’re done with this interview and try it for the 28-day refresh and see how that works. I thought that was pretty cool product that you’ve got there. Lucy Hayhurst: [00:07:55] Yeah. Thank you. Yeah. We can also get people signed up for a three-day free trial if you’re not ready to commit to the whole 28 days. Peter Margaritis: [00:08:04] Okay. I think I’m ready to commit for 28 days. I’m not afraid of it too much. Lucy Hayhurst: [00:08:11] You’re ready . Peter Margaritis: [00:08:12] So, you’ve got this love of food. And one of the stories that your mother shared, Lucy’s mom is Cathy Paessun, who’s the Executive Director for the Central Ohio Diabetes Association. And she shared a story that you just relocated to Raleigh, Durham, and didn’t have a job aligned, and want to kill your mom now, aren’t you? Lucy Hayhurst: [00:08:37] Yeah, no, it’s great. Peter Margaritis: [00:08:38] So, you go ahead and finish the story. Lucy Hayhurst: [00:09:38] It sounds pretty spectacular. What we learned is when people are paying $50 a month for a gym membership, you’re not excited to pay another $50 -$100 to see the nutritionist. That’s where insurance comes in handy. Lucy Hayhurst: [00:10:11] That’s not untrue. If you’re looking baffled or you have questions, I am there to help. A lot of times, people avoid the produce section because they don’t know, “I don’t even know what a scallion looks like,” and that scares them. And so, they just stay away from it. And I make it my mission to, if somebody’s got that question look on their face, I’m totally down to help them to find what they’re looking for. Peter Margaritis: [00:10:39] Well, I needed some help because I thought a shallot and a scallion were pretty much the same thing, but you just use the green part versus the white part. I thought that was the difference between the two. And I’ve learned that’s completely wrong. Lucy Hayhurst: [00:10:52] Right, right. Shallot is the fastest way to make any meals seem restaurant fancy. A little butter and, finally, diced shallot with your eggs in the morning, you’re officially feeling all kinds of fancy. Peter Margaritis: [00:11:08] So, you said a little butter. My inner Bill Clinton is coming out now. I’m going to ask you something. What’s your definition of a little butter? Lucy Hayhurst: [00:11:16] That’s a good question. Well, so, here’s the good thing to know. Fat is our friend. So, all that stuff that you grew up with in the ’80s and ’90s, hearing how fat is evil, thank God, we have thrown that away. And that’s our friend. So, when I talk about a little butter, I want you to hold out your thumb, and bend it the knuckle, and that top part, that’s how much butter I want you to use at each meal. Peter Margaritis: [00:11:46] Not that much. I got my index finger sticking out. And just a little bit of butter. Excuse me. This is a French version of just a little bit of butter. Peter Margaritis: [00:11:56] The whole index finger. You got it. Lucy Hayhurst: [00:11:59] Sometimes, a little bit more. But a lot of times, I find people are terrified when I start asking them to add peanut butter, or regular butter, olive oil, mayonnaise. Yeah. But I’ll tell you what, if you want a way to cut your cravings, add fat. It is your friend. Peter Margaritis: [00:12:21] Now, add fat, but there’s got to be that a little bit of fat. And from a gram’s perspective, how many grams of fat should we add to our diet? Lucy Hayhurst: [00:12:34] I should have known the CPA was going to want to talk about numbers. At Well-Balanced Nutrition, we don’t actually get caught up in the counting of calories and grams of fat because, well, first and foremost, as humans, no matter how precise you think you’re being, you’re really stuck at it. Peter Margaritis: [00:13:40] Two years ago, I had my gallbladder removed, and I had sludged, and I couldn’t eat. I was on extreme low-fat diet just to get to the point of the surgery. And then, they said, “Give it six more weeks. Don’t add any major fat back in.” And they said, “Some people, it’ll take even longer.” And for me it was about a year and a half until I could eat really any amount of fat back into my diet. So, I think, all the time that I didn’t have fat in the last six months, I’ve compensated for what I’ve missed, plus. And I’ve got to go back to not adding as much fat back into my diet because I can tell a big difference when I put too much fat that it does affect your drive. It does affect your motivation. You feel a lot more sluggish. Lucy Hayhurst: [00:14:34] Interesting. And I think what’s really important to note is just how much it varies person to person. And so, yeah, definitely listening to how it makes you feel. And it’s like your body’s saying, “Hey, if I have too much of this stuff, I feel terrible.” And some people get that. They’re eating what they think are really healthy like, “I’m eating broccoli, and roasted chickpeas.”. Lucy Hayhurst: [00:15:31] That’s the biggest misconception or misnomer when it comes to nutrition and wellness, in my opinion. All of us should be following the same rules. And frankly, that’s not it. We can’t follow the same rules. If that was the case, then all of us would be healthy because there would be just one perfect diet. Peter Margaritis: [00:15:52] Interesting. So, we’re all different, and we need to listen to our bodies to tell us what’s good and what’s not. Add a little fat to your diet because that makes me think of even from a leadership perspective, the old leadership style is, “I’m going to manage everybody the same way.” Back the baby boomers. Today, it’s well, Pete is a lot different than Lucy, and what motivates Ken over there is not to same that motivates Jennifer over here. So, we’ve got to modify that style. And even with that, we have to modify the way we consume. Peter Margaritis: [00:16:32] But I would say, I remember my days when I was a Pricewaterhouse during tax season, and I’m up to my eyeballs, and in files and stuff, and the pizza was — It felt like I was there every night, but there will be some type of fast food dinner every evening that they would bring in first to eat and very little salad or anything. Now, I know that that has changed. But to some degree, it still exists when we’re talking about those, the busy, whether it’s a finance professional or any type of business professional, when they’re in that stressed time of year, diet goes, or nutrition just goes right out the window. Peter Margaritis: [00:17:14] What advice would you give someone who’s going through that to don’t throw it out the window, look at it from a different perspective, or change their mindset to think about things differently? Lucy Hayhurst: [00:17:28] Well, I think you just hit the nail on the head right there with changing your mindset. And what I’ve come to figure out a lot of what happens is when people are off in the real world, then you’re focused on the things that are important or urgent to you. So, for a lot of people listening, you’re really concerned with making sure that you get on top of all the paperwork, and juggling all of these clients’ requests, and spreadsheets, and forms, and all of that. And so, not surprisingly, figuring out what you’re going to eat has gone all the way to the backburner if it hasn’t completely fall off the stove. And, instead, food just becomes this thing that you have to do instead of something that you’re maybe thinking about and making mindful decision of. Peter Margaritis: [00:19:13] So, you’re saying baby steps. Lucy Hayhurst: [00:19:15] I’m saying baby steps. Peter Margaritis: [00:19:17] So, it’s not a New Year’s resolution because I’m may eat and drink everything I can for April — excuse me, December 31st. And beginning January 1, I’m cutting it all out. And that’s why we fail in our New Year’s resolutions. So, it’s one thing to change that you feel like you’re doing wrong, figure out how to make it right, and see that through. Now, I’ve been told that it takes like 21 days to start a habit because that’s what that on the internet and interwebs, But I’ve learned that it’s wrong because researchers actually show it’s 66 days to start a habit. It’s a lifetime to maintain that habit. So, do that for 66 plus days, and then pick something else. And then, by the end of the year, you have made some changes. Lucy Hayhurst: [00:20:12] Exactly. And I think it’s good to note that 66 days is that average. I will tell you when I started adding a 10:00 p.m. snack into my life, my brain only took about three days to start that habit because that was very rewarding. And so, habits can happen really quickly. It doesn’t have to take 66 days. Sometimes, habits are a little harder. Like for some people, exercise is something that even if you do it solid for two months, it’s still like, “I’m dragging myself out the door to go to the gym,” because maybe it’s not that magic 66 days. So, I just like to say that, so that people don’t get completely attached to like, “Well, I have to do it this way,” because it might not take that long. It might take less time, or it might take more time. Peter Margaritis: [00:21:06] More time. And then, when you describe that, your 10:00 p.m. snack, you said a magic word. It was a reward. Lucy Hayhurst: [00:21:11] Reward, yes. Peter Margaritis: [00:21:14] So, it was a reward, which sent the dopamine in your brain going, “Yeah, I got a reward,” which now creates that habit a lot quicker versus, “Oh my god. I’m going to the gym again,” or “I got to climb on that elliptical again. I don’t want to get on the elliptical today. I just want to-” So, yeah, it’s also a different mindset. If you look at the exercise as a reward, then maybe it all takes 66 days. But yeah, it’s also the way we look at things and making that change can help us accelerate that habit versus the dread, the anxiety. Peter Margaritis: [00:21:50] But in your business, I know you work with individuals, and you work with companies, and you devise a nutrition plan. Do you also go down the path, with the nutrition, how much exercise you should include into your daily life? And what’s your definition of exercise? Lucy Hayhurst: [00:22:11] Well, I try to stay in my wheelhouse. So, while we do talk about exercise, it’s more a matter of finding that joyful movement because for a lot of people, exercise is a four-letter word, and they’re like, “Ew, gross, I hate exercise,” or “I hate the gym,” or whatever story you’re telling yourself of why you’re not doing this thing. And then, also, the shoulds of like, “I know I should blah, blah, blah,” and really helping my clients recognize what’s the speed bumps that’s stopping them from doing more physical activity. And together, we work through those speed bumps, so it’s less like, “You need to be on the elliptical three days a week for 30 minutes.” I have only used elliptical twice in the last month because it’s just it’s over done for me. So, now, thank goodness, down here, maybe I should talk about the weather, but North Carolina, it’s been moderately okay to just go outside and take a walk. So, that’s what I do. Peter Margaritis: [00:23:16] I love the term joyful movement. What is a joyful movement? And there’s movement, take the stairs, do some things, but those speed bumps, what are some of those speed bumps that get in the way? Like I used to love to run, and I was training for a marathon. My speed bump now are my knees. They can’t take the pounding. So, I’ve had to quit running. And, now, I bike. Elliptical, things like that, they’re easier on the knees. So, the knees are a speed bump. Peter Margaritis: [00:24:28] No, it does. It does. I mean, there are a lot of different speed bumps out there that keep us from exercising. And it’s like there’s got to be another way to do that, whether it’s walking, whether it’s something. My wife just had total knee replacement, and the doc said, “Don’t even think about running. Don’t even think about running, but you need to do something. You need to-” And she’s going to get back up on the elliptical. She’s going to start biking, something to take it, so there’s not that pounding on the knees. Peter Margaritis: [00:25:03] I think, knees and backs are probably the two big speed bumps out there that keep people from exercising. And to recognize that and get help for those speed bumps but try to find a way to have some type of activity in your life because the diet and the exercise, we hear it all the time, but we need to kind of live for that, which is going to take me down a path that I had mentioned I’m a Type 1 diabetic. We get type 1 who are insulin-dependent, and type 2 who are insulin-resistant. Do you help type 1 and type 2 diabetics with their nutrition plan in order to be able to manage their diabetes better? Lucy Hayhurst: [00:25:46] Yes and yes. I’m hesitant because Well-Balanced Nutrition, we don’t specialize in diabetes counseling. We specialize in helping busy professionals and motivated individuals that don’t want to be on a diet roller coaster anymore get off the diet rollercoaster and live well-balanced. So, there are diabetics that I see that have wanted and needed to change that relationship with food and really change their behavior patterns, which is what we specialize in, because we don’t give prescribed diets. And that’s not to say that it’s not a good tool to have. That’s why we have that tool on our website because some people do just need a kickstart, and they need the structure, “Tell me what to eat.” And I get that, but meal plans and diets are a dime a dozen. You can go online and type in, “Give me diabetic meal plan,” and you’ll come up with hundreds. Lucy Hayhurst: [00:26:56] Free. You don’t need to see a dietitian for that because it’s out there, it’s online. What typically people need a dietitian or a coach for is actually making the behavior changes become a lifestyle change. Peter Margaritis: [00:27:11] So, the aspect of you and your business partner are probably, first and foremost, coaches to help people change that mindset, to live that well-balanced nutrition life. And hearing you, there’s really no foods that are off limits per se, which was when my son was diagnosed as a type 1, in the back of my mind, when the nutritionist came in at Children’s Hospital, was talking to us, you’re going to get the riot act now. They’re going to tee up. And she said, “You can have anything that you want in moderation. The only thing I suggest that you do not have, and you get rid of are sugary soft drinks, period.” Outside of that — And my jaw hit the ground. And you’re telling, at that time, a 15-year-old boy that he can eat everything, but he doesn’t hear moderation. “Well, they said I can eat almost anything I wanted,” but just trying to also help with that relationship of what it’s doing to his body and his blood sugar was still to this day is a challenge. Lucy Hayhurst: [00:28:25] Right, yeah. So, when it comes to diabetics versus the rest of the population, when it comes to what we do, when it comes to diabetes versus the rest of the population, I don’t know if this advice is exactly the same, but what I really want people to hear is that old adage of everything’s good in moderation is total crap. Peter Margaritis: [00:29:16] Go on, please. Lucy Hayhurst: [00:29:17] I want everybody out there listening to think about the last time you opened your favorite crinkly package whether that was Oreos, chips, pork rinds, I’m throwing it all out there. Some people, it’s even something healthy like that dry roasted almonds. But last time you opened that crinkly package of your favorite food and the serving says, like, for instance, Oreos, it’s two cookies. I want everybody to take a moment and think about last time you ate two Oreo cookies. Uh-huh. I’m waiting. I haven’t heard anybody. Peter Margaritis: [00:30:01] Yeah, or 13 chips is one serving. Peter Margaritis: [00:30:06] Yeah, right. Lucy Hayhurst: [00:30:07] 13. And as a dietitian, I literally count out 13 chips. But I know, again, I’m weird, and the vast majority of people are not quite so diligent. Peter Margaritis: [00:30:22] So, if moderation, how do you define it, or how do you put it? Now, if they moderation because nobody’s really good at moderating themselves or monitoring themselves, so what’s the alternative solution there? Lucy Hayhurst: [00:30:36] Recognizing what your trigger foods are. And in the book, Better Than Before, by Gretchen Rubin, she talks about this idea of moderation and abstinence. And I think of it as very much a spectrum because I’m a gray zone kind of person. And some things — I mean, for me, dry roasted almonds are very easy to eat in moderation. I can have seven and be totally fine. You put those covered with dark chocolate, forget about it. It’s like, “Oh, I just want to keep eating, and eating, and eating.” So, I know that it’s a bit of a trigger. Lucy Hayhurst: [00:31:17] Luckily, I figured out if I hide them from myself in the cupboard, and I pull out just that little dish on Friday night, and count out my seven chocolate almonds, then I can put them back in hiding, and that’s fine. Like I don’t get triggered to go back for more. That’s not true for everybody. Some people are like, “Yeah. If there’s a container of ice cream in my freezer, that’s going to be gone by the end of the night.” Know thyself is step one. Peter Margaritis: [00:31:50] Yeah. Ice cream, that’s one of my Achilles heel. And I don’t know if they still have it, but they used to make these things called Dibs, little vanilla ice cream covered with chocolate. You just pop them. Lucy Hayhurst: [00:32:05] Oh yes. Peter Margaritis: [00:32:05] Either I tried the whole moderation. You only have this many. And then, next thing you know, the whole thing is gone in one evening. I just don’t buy. For me, I can’t buy them anymore. I don’t even go down the ice cream aisle. I haven’t had ice cream in forever because that’s one of my addicting foods. And the only way that I know that if I want to stop it, I just can’t even have it in the house, period, versus there’s a few things in the house. Like I just have — I’ll count them out, and I’ll hide them, but I know the hiding spot. An hour or so later, I’m back in there getting it. Peter Margaritis: [00:33:26] So, you work with individuals, you work with corporations, and you’re also also out there, to some degree, on the speaking circuit because you are a professional speaker. Lucy Hayhurst: [00:33:39] That’s right. Peter Margaritis: [00:33:40] And what type of conferences, what type of venues do you seek to come in and present your information? Lucy Hayhurst: [00:33:49] Well, I think, my most favorite right now is I do small group sessions for some of our corporate relationships here in Durham. And I love that because, then, it’s this opportunity for the same group of people to get together, and be vulnerable, and open with each other talking through all the things that we’ve been talking about right here where people have these ideas about nutrition and think others should be so easy, but it’s not. So, getting people together and having that group experience, which is also the other thing that we’re doing, which is meal prep workshops, or, as I’m calling them, well-balanced meal prep parties. Peter Margaritis: [00:34:30] Well-balanced meal prep parties. Lucy Hayhurst: [00:34:34] Yes because people think — I mean, meal prep and party don’t typically go together in somebody’s mind. We have five or six of your dear friends or favorite co-workers, plus a bottle of wine, and you got yourself a party, while you’re also preparing meals, so that you don’t have to do it during the workweek. Peter Margaritis: [00:34:58] Well, my wife’s very interested because you include wine, but yeah. So, I think a meal prep and party, that’s like fusion. It’s like a meal prep party fusion kind of thing where you get two separate things. So, you’re planning out your meals, you’re cooking your meals for the week, you got friends over, you’re having a good time. Lucy Hayhurst: [00:35:19] Yeah. We don’t actually do the cooking. You’re doing that prep part. So, it’s like having your own sous chef. You do the chopping. One of our favorite things at one of our dietitian fast food meals that we talk to people about is getting cheap pan dishes together where you just take whatever vegetables, we’ll say like our favorite right now is butternut squash, onion, Brussel sprouts. And then, you combine this yummy maple Dejan sauce together, pour it over the Brussels sprouts, and then you throw in maybe some turkey sausage or some chicken tenders. Throw that all in the oven at 400 for about 25 minutes, and, bam, you got dinner on one beautiful plate. Peter Margaritis: [00:36:04] Wow. Now, the butternut squash and the Brussels sprouts don’t excite me. So, I assume I could substitute something for that. Do you have that recipe on your blog? Lucy Hayhurst: [00:36:18] Well, not yet, but we do have our other recipe, which you saw, which is the citrus salad. So, that’s really great, especially as we’re getting closer to springtime. So, citrus is really in season right now. But the salad is that like, “Oh, spring is coming.” And it’s nice because, again, this is something you build at the beginning of the week. And then, you can put that in a mason jar, airtight, throw it in the fridge, and that sucker is still going to be good three days later. Peter Margaritis: [00:36:50] Got it. Peter Margaritis: [00:36:52] Yeah, yes. This is exciting. This is all good stuff. I love what you’re doing. And you did tell me when we started that you’re primarily keeping your business in the Raleigh, Durham area and the North Carolina area. But I would assume if somebody has questions from, let’s say, I don’t know, State of Ohio or I do know that a large part of my audience is located out in California. Lucy Hayhurst: [00:37:21] Got it. Peter Margaritis: [00:37:21] So, if they went to your website, wellbalancednutrition.com, and say, “You know what, I’d like to talk to Lucy about this,” you would take that phone call, wouldn’t you? Lucy Hayhurst: [00:37:32] Definitely. Yes, definitely. We have capabilities to do virtual calls. And in California, that’s actually covered by insurance, which is pretty rad. So, we are fully capable and ready to help anybody across the country. It just happens to be that we live in Durham, North Carolina. Peter Margaritis: [00:37:54] And so, if you could do me a favor, and provide your nutrition plan, but just the opposite of it to the Duke Basketball in North Carolina Tar Heels Basketball Team, make them gain a little weight, become a little bit more sluggish now that we are into March, yeah, that would sue this Kentucky Wildcats fan a whole lot. Lucy Hayhurst: [00:38:16] I’ll see what I can do. I think I got a couple of friends on the inside. Peter Margaritis: [00:38:23] That’s cool. Well, I applaud you for what you’re doing. You’ve got a lot of passion you. And your mom shared with me that you are a very driven, very passionate as it comes to food, and you tell that great advice. I’m going to put your website in the show notes. How can people find you? How do people reach you? What’s your email address if you don’t mind giving that up. Lucy Hayhurst: [00:38:47] That’s fine, yeah. It’s lucy@wellbalancednutrition.com. Lucy Hayhurst: [00:39:28] The Living Plates or the Refresh Challenge. Peter Margaritis: [00:39:32] Yes, the Living Plates and Refresh Challenge. It would be worth a few moments of your time. And we all can do a better job in our nutrition become a little bit more healthier because when we are, we’re much more driven, happy, and motivated. Lucy Hayhurst: [00:39:49] Exactly. And yeah, we are living better and helping those that we want to help better when we help ourselves first. Peter Margaritis: [00:39:57] Exactly. So, Lucy, thank you so very much for your time. I’ve enjoyed the conversation. Hopefully, some time, I do get out to the Raleigh, Durham area that our paths will cross. Maybe we can go out to dinner, you, and your business partner, and I. And maybe now, I’ll start to see what I eat, and know you shouldn’t be eating that. I’ll tell you the result. Lucy Hayhurst: [00:40:15] Start listing down. Peter Margaritis: [00:40:15] I’ll tell you the result. But it’s been a pleasure. I can’t wait until our paths cross and meet face to face. Lucy Hayhurst: [00:40:25] Wonderful. Same. Likewise. Peter Margaritis: [00:40:28] Thank you. Peter Margaritis: [00:40:34] Now that you’ve listened to this episode, what are your next steps in becoming more balanced in your nutrition? Remember what Lucy said, pick one thing, and work on it to change the bad habit, and to change your mindset. Baby steps, that is the answer. Peter Margaritis: [00:40:53] If you’d like to contact Lucy, her email address is lucy@wellbalancednutrition.com. Thank you for listening. And if you enjoy this podcast, please subscribe and show this episode with a friend. Also, please visit www,c-suiteradio.com to listen to many of the outstanding podcasts that they have in their network. Have a great day. Announcer: [00:41:28] Like what you just heard? Because it’s c-suiteradio.com. C-Suite Radio, turning the volume up on business.